It’s been 150 years and we here at Picture This! Framing and Gallery are honouring this special anniversary with a show dedicated to Canada’s artists and the country’s landscapes, seascapes and spaces called Canada Scapes & Spaces. The Northern Lights; the wind swept coasts; the Rocky Mountains; these are images that form our country’s identity. And it is the artists of our country that bring that to us. To see how our country has evolved artistically let’s take a look at the history of our artists and the art that shaped us. Canadian Art has always been dominated by the breathtaking scenery. From the Great Lakes to the prairies and oceans, Canadian art is connected with nature. The railway that linked our country also played a role in shaping our image of Canada’s artistic identity. As the country expanded westward, the creation of the railway to those new frontiers also brought painters and photographers to document the burgeoning country. 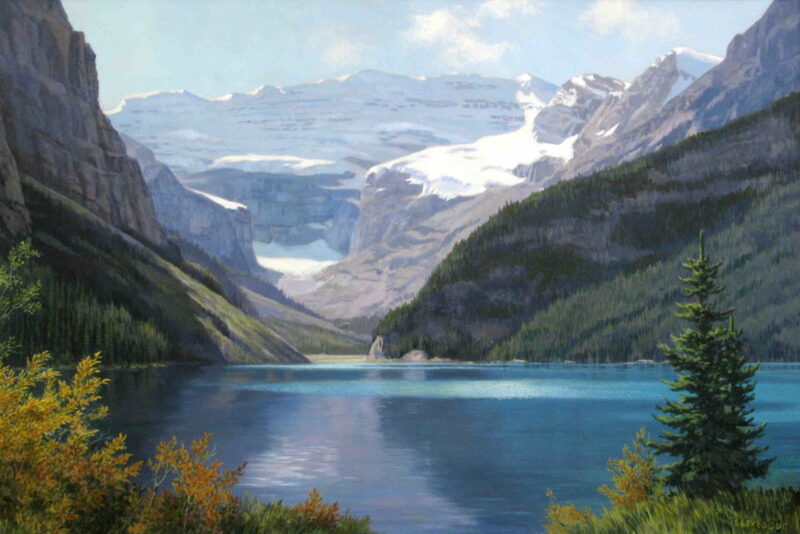 The Canadian Pacific Railway helped spur the demand for these early artists’ work by distributing free passes in exchange for promotional pictures of scenery visible from the trains. Many of these watercolours and oil paintings became the significant symbol of what Canadian art was in the 19th century. During the founding of our nation, there were several attempts at bringing together the country’s artists. Montreal had tried a Society of Canadian Artists which was short lived, but a group of Toronto artists came together to form the Ontario Society of Artists in 1872. It would host exhibitions and be the driver for a provincial art museum and art school to foster Canadian artists. Soon after, in 1880, the Royal Canadian Academy of Arts was founded in Ottawa. 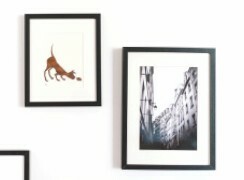 Artists would donate a piece of art as a condition of membership. This collection helped form what is today the National Gallery of Canada. The 1880’s also brought us one of our country’s most famous paintings. In 1883, Robert Harris was commissioned to paint the Fathers of Confederation. 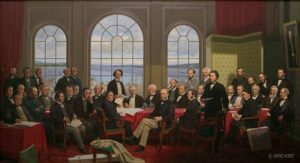 The painting depicted the Charlottetown Conference of 1864 where the founders of Canada first debated what our country would look like. It was destroyed by fire in 1916. In 1964, Rex Woods was commissioned to recreate the iconic image. In honour of the original artist the painting included a portrait of Harris hanging on the wall of the room. Canadian women were prominent in influencing art from the beginning. Elizabeth Armstrong Forbes and Frances Anne Hopkins were well respected and had their works shown at exhibits from New York to London. Forbes portraits sold more than many of her male counterparts and her school of painting she operated with her husband Stanhope Forbes was an incredible success. Hopkins was the daughter of an officer with the Hudson Bay Company. Her paintings of the voyageurs traversing the waters of Canadian rivers were rich in detail and accuracy. Her Canoes in a Fog, Lake Superior showcased a world few knew outside of the Canadian frontier. 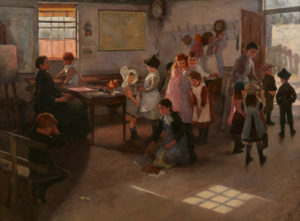 Her work became very popular in Britain and helped shape Canada’s identity in its early years. Arguably, the most famous Canadian artists were a group of landscape painters that began working together in the early part of the 20th century. The Group of Seven consisted of Franklin Carmichael, Lawren Harris, A.Y. Jackson, Frank Johnston, Arthur Lismer, J.E.H. MacDonald, and Frederick Varley. The group spent much of their time depicting the lakes and boreal forests of the Canadian Shield. It is their work that transformed Canadian art. Their representation of landscapes and idyllic Canadian scenes became the quintessential idea of what Canadian art was all about in the first half of the 20th century. Two artists that were closely associated with the Group of Seven but were never official members were Tom Thomson and Emily Carr. Thomson died in 1917 before the official title of Group of Seven was established, but the members credit him with having a major influence on them. 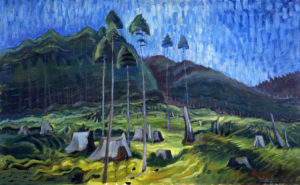 Emily Carr was inspired by the First Nations along the Pacific Coast. Even though she didn’t have her first commercial solo show until 1944, her works remain some of the most important in Canada’s art history. The post war period was a boom time for Canadian art. 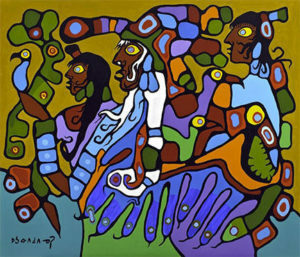 Aboriginal artists started to make a big impact on Canadian culture. Names like Carl Beam, Norval Morrisseau, and Alex Janvier depicted Canada from an indigenous perspective. Their work didn’t include the landscapes and scenes of Canada that had become the mark of the group of seven. Instead their inventive use of colours and abstracts shone a light on Indigenous people, their struggles, and their triumphs. The breakthrough of aboriginal art inspires a new generation of indigenous artists, like Karen Haines and Jason Carter. Around the same time, abstract art was becoming more prominent. The Painters Eleven group formed in 1953 in Oshawa. The 11 artists introduced abstract paintings that were popular in New York. Through the Fifties the group achieved international acclaim for their work before disbanding and going their separate ways in 1960. Now Canadian artists are making a name for themselves around the world, in all forms and mediums. But given Canada’s vast geography and its gorgeous natural settings, the country will always be a favourite for landscape artists. 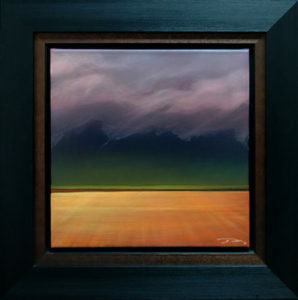 Some of those majestic scenes are captured by current Canadian artists like Dean McLeod, Marilyn Hurst and Rod Frederick. Come down this summer to see their impressive work at the Canada Scapes & Spaces art show running from July 1st to August 31st, 2017.